In past articles, I have stressed how important it is to vacuum your carpets and rugs regularly. Since that is something we harp on, I am consistently asked “What is the best vacuum to get?” I do not have a specific brand to recommend but here are some tips on what to look for or consider when buying a vacuum. For carpets and rugs, this is important. 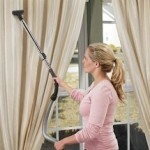 The beater bar brush is needed to loosen up the dirt during vacuuming. Upright vacuums do a better overall job on carpets, though canister vacuums are easier to maneuver, especially on stairs. Also, top of the line canisters typically have a motor-driven head for better carpet cleaning. Bagless vacuums save you the cost of bags, but like bagged models they still require filters. Emptying a bagless vacuum is also a dustier process, a concern if you have asthma or allergies. Edge-cleaning tools help at corners and baseboards. If you will use your vacuum to vacuum draperies, make sure it has a suction control feature in order to protect the drapes. If you will use your vacuum for both bare floors and carpets, get one with a brush on/off switch. This will help safeguard from scratching bare floors and prevents scattered dust and debris. Most Important, give it a spin before buying. Even if you order your vacuum online, visit a store first. Push, pull, turn and lift any models you’re considering. The bottom line is, you may have the most expensive, fanciest vacuum, but if it is heavy, awkward to use or move around and you do not use it, it is a horrible vacuum. The reality is that the best model for you (whether cheap or very expensive) is the one you will use.